A group of citizens of Stuttgart, close to the town where the German poet Friedrich von Schiller (1759-1805) was born, ordered a statue of the poet from Thorvaldsen in Rome. The statue was to be a tribute to one of Germany’s biggest poets. The statue was finished in 1836 and is still in its original place in Stuttgart. In the sketch, which only measures 83,5 cm, Thorvaldsen has determined how Schiller was to be portrayed in a calm, dignified and thought manner with a laurel wreath on his head. 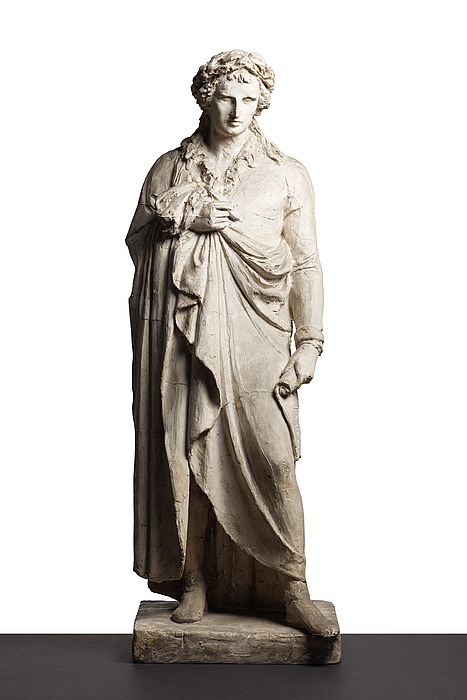 The finished statue, which measures nearly 4 metres in height, was modelled by Thorvaldsen’s apprentice Wilhelm Matthiä, and then cast in bronze.